How To Be Stoical With Your Time Management. Why accepting responsibility for your own time management is important for your sanity and your productivity. I recently discovered I am slightly stoic. I accept bad things will happen in life, to me and to others and understand my response to those bad things is entirely in my own hands. The same attitude is something I bring to my time management and productivity. It is very easy to blame bosses, clients and students for our inability to complete projects, but in reality, it is we who have ultimate responsibility for how and where we spend our time each day. That is the world we live in and the sooner we accept that the better it will be for our time management and our sanity. Time is the most equal of equal opportunities employers. Every day, we all have exactly the same amount of time. Nobody has more or less. We have twenty-four hours. It does not matter whether you are Tim Cook, Warren Buffett or a freshman in college; we all face the same decisions every day about where to spend our time. If we choose to work on our college assignment all day and manage to get six, good quality hours of work done on it, then that is what we chose to do. At the same time if we plan to spend six hours writing our thesis, but wake up late, spend four hours responding to social media messages and email, then it was our decision to do so. These are just the choices we all have to make each day. It’s no good blaming other people, your email or phone. You always have the choice to ignore those emails and messages. This is where so many people get stuck. Rather than making the decision to focus on the important stuff, they make the decision to focus on the unimportant stuff, then find themselves panicking and rushing to get the important stuff done later. This leads to missing out on sleep, increased stress and strain and a never-ending cycle of blame and a persistent feeling of being busy. The good news is we all have the power to stop this. All we have to do is make a decision to spend our time on the important work first and, if we wish, we can choose to reward ourselves by allowing time to work on the less important stuff later. We can choose to use the powerful tools that come built into our devices to schedule time, to tell us what to do and to capture our great ideas. Equally, we can choose not to do so. 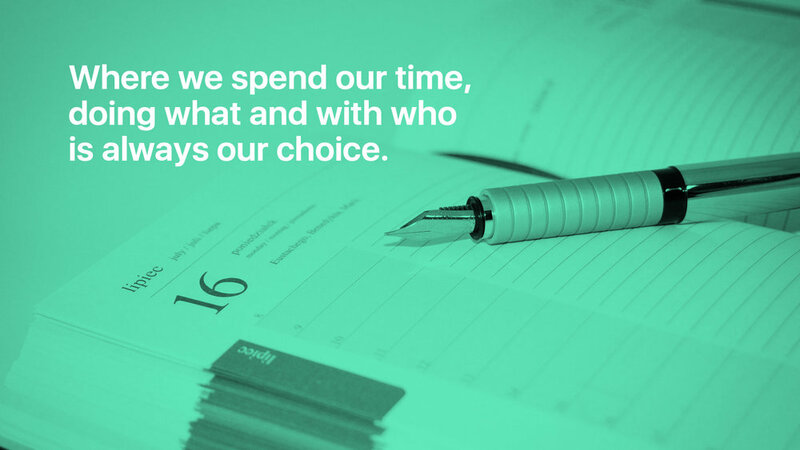 Ultimately, where we spend our time, doing what and with who is our choice. Even within your office, when you joined your company, you signed an employment contract that meant that for eight hours a day, Monday to Friday, you would give those hours to the company, and in return, they would pay you a sum of money. Signing that contract was your decision. A decision about where you would spend thirty-five to forty hours of your 168 hours each week. It is no good complaining about how little time you have to spend with your friends and family afterwards. You chose to spend those thirty-five to forty hours each week in your office. If you then choose to work more hours, regularly working an extra two or three hours a day, then for whatever reason you decided to work those extra hours, you still chose to spend those hours in your office and not with your family. It is no good complaining about your boss always giving you work at the last minute, or your colleagues interrupting you when you are trying to get the important work done. That happens to everyone no matter their position in the company. It is still your responsibility to decide where to focus your efforts and what you will do with your time. Time spent complaining about it, is not going to get the important work done. You have a personal responsibility to develop ways to stop those interruptions and to get your boss to give you the work in a more timely manner. Just making this tiny shift in your approach to each day will reward you with a lot less stress, more time to spend on the more pleasant things in life and you will feel a lot less busy. But once again, you can choose not to do so. It is always your choice. Thank you for reading my stories! 😊 If you enjoyed this article, please hit that like button below. It would mean a lot to me and it helps other people see the story.